14 year-old Alexandria Aurora Fortunato was a simple goose girl, until the day she kindheartedly helped a ragged old beggar woman, who "rewarded" her with gold dandruff in her hair and diamonds that fall from her tears. Now she finds herself locked in a tower as various unsavory princes and kings fight over her hand. (Only desiring her money, of course.) She engineers an escape with the help of her geese, who manage to fly her out of the tower. Have you ever spent time with a flock of geese? 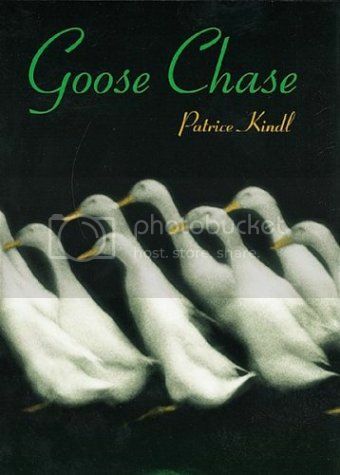 The geese in this story - a little bossy, full of personality, mostly loyal, are delightful. Goose Chase is true to the title - there is a lot of travel, and chasing throughout the story. Soon after making her getaway from her prison tower, Alexandria finds herself enslaved by a family of dim-witted ogresses, Nellie, Lucinda and Tessie. Bumbling Prince Edmund attempts to come to her rescue, but ultimately Alexandria must rely on her own wits, her magical hair, and her loyal geese to save the day. There's a wonderful lost fairy tale feel to this story. Alexandria's magically growing hair and tower imprisonment remind one of Rapunzel. The diamond tears seem inspired by The Fairies by Charles Perrault. There are enough thee's and thou's to give the story a old-timey, medieval feel without being too inaccessible for young readers. Fast-paced, funny and witty this was a quick read. I'd recommend this for 4th and 5th graders.